I have a 69 A65 that is going back together. its a bitsa, but mostly a 69 chassis. the rear brake arm was pointed up, rather than down when I got it. It looks like that is the only way it can go with the return spring I have. Any worries about leaving it up? I noticed the OIF ones are that way. -- other than it LOOKING wrong for a 69. OIF 71s and 69 A65 , the rear brake arm points down, well mine does anyway, if it points up you may need to get creative with the brake rod so it clears the rear suspension. 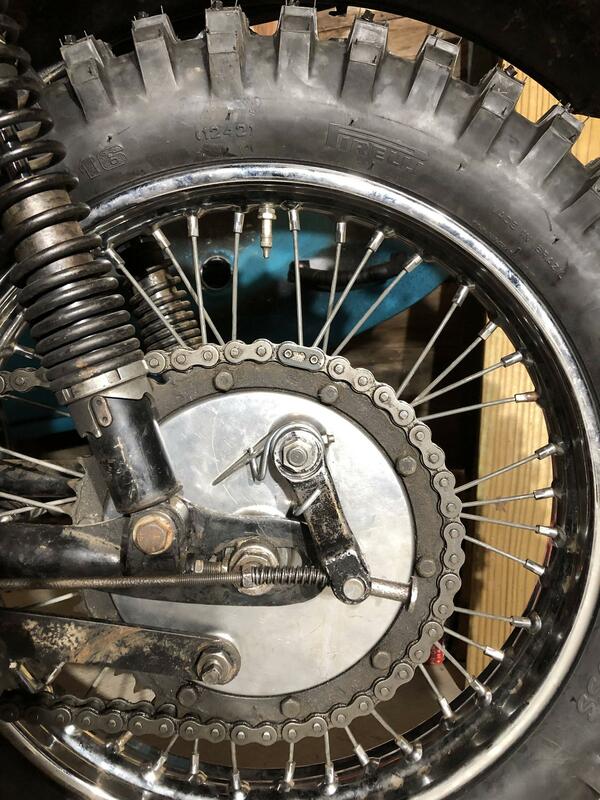 I would get the correct spring, its more aesthetically pleasing if the brake rod is parallel to the swinging arm and you wont have clearance issues.. 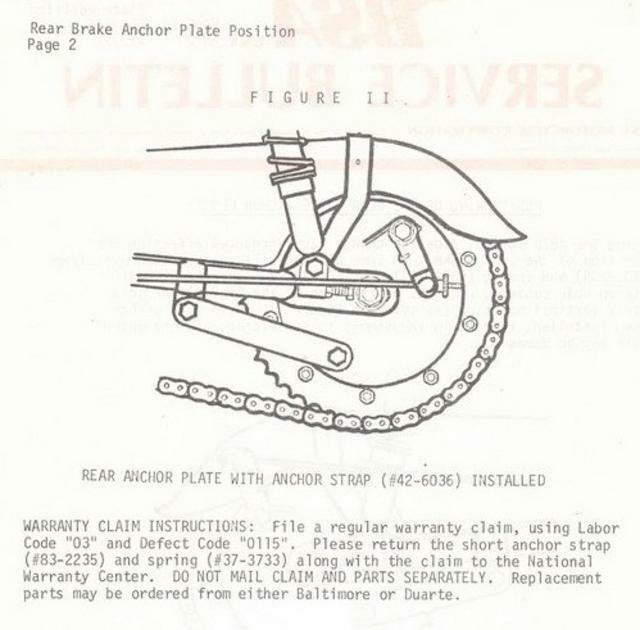 Looking at pics of other 69 A65s, it looks like down is the correct orientation for the rear brake arm. Check you have the right brake plate fitted, maybe some pics would help. I have seen some 71 onwards OIF A65;s and B25;s with the brake arm pointed upwards, this may be an attempt to improve the brake performance by changing whether the leading or trailing shoe contacts the drum first but I'm not sure it works. I would try the standard 69 setup which is with the brake arm down. Gunner makes a good point about the shoe/ cam/ lever orientation. 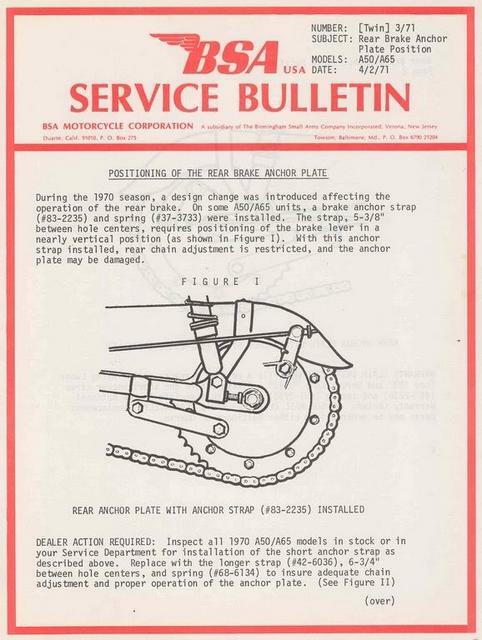 With the Op lever up, the forward / leading shoe will operate from the top of the cam and come on first,and may be a bit severe, IMO BSA got this brake dead on, note the shoes are not lined equally, the manuals make no mention of this, on my 71 ( still on its original linings!) the leading shoe has a shorter lining than the trailing shoe, I think this is to prevent grabby operation. I actually have the same exact question with my 1967 Royal Star. The rod was not clearing the suspension so I've flipped it and purchased an OEM spring, since the spring that was on there was way off. The issue I'm having now though is figuring out how to get this rear brake working properly. Last edited by RyanO; 01/19/19 11:22 pm. The spring is on upside down, the short end is located in a hole in the alloy supporting web. i will try to search out a link for you all to see when i have more time in the next few days. DEALER ACTION REQUIRED inspect all 1970 A50/A65 models in stock or in your service department for the instillatio of the short strap as described above.....replace with longer strap (# 42-6063) and spring (#68-6134) ............it then goes on to detail the warranty claim procedure. so yeah although some left the factory with the arm pointing upwards this is actualy wrong according to the recall. I'm glad to see that service sheet. I remembered that this issue came up a few years ago, but not the details. Clears it up perfectly . BOTH, again, are correct from factory, but the up-arm is problematic. Also thanks @rockscientist this thing is in my garage, I just quickly tossed the nuts back together so they weren't floating around and I didn't lose them anywhere. And, Ryano... There should never be a greater than 90 degree angle between the brake rod and the actuating lever, as this dramatically reduces leverage on the arm. Either your brake shoes are badly worn, or you just need to rotate the actuating lever to the next spline (or two) when you install it. I see also that the nut on the brake arm is not all the way on. This may be because the spring is on upside down, as Gavin pointed out, but that nut should be flush with the end of the cam pivot when tightened down. All good feedback I appreciate it! Can you let me know if this is looking better? I had a little bit of time to mess with it this AM. I think this looks more or less like the image in that service bulletin. The last two pictures are just making sure I have this orientation correct as I don't want to try and fit this spring on with brute force and ignorance and end up with a badly warped one like one of the ones I have here. Can you let me know which side the short arm goes into? Left or Right? And then I assume I just use a flat tip screw driver to pop the long arm onto the brake arm? The brake arm angle looks good now. I'm not sure about the spring though. As noted above, one end of the spring should protrude through that hole in the plate abutment. The other end of the spring should wrap around the brake arm, and should be visible in the picture. There doesn't have to be a whole lot of tension on that spring - the main force keeping the shoes away from the drum is provided by the springs that pull the shoes together. 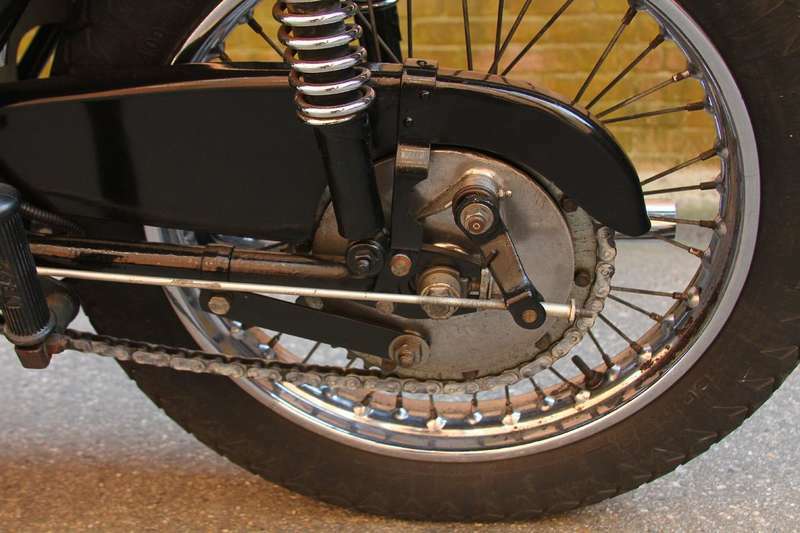 The brake arm spring is merely to keep tension on the brake rod & return the brake pedal to its stop when released. Do you have any pics of your setup with the spring? The brake arm pivot seems to be working decent. Last edited by RyanO; 01/26/19 9:10 pm. you can see my "as bought" 69 chassis with the short anchor strap and up arm. If you look at the geometry, there will be little chain adjustment before the short anchor strap is almost fully extend (for lack of any better words.....) the next pict is of a low position arm with long strap (441...but A65 is very similar) zoom in to see the spring. Mine is not assembled yet, so I don't have a personal pict of the new strap and spring. Last edited by rocketscientist; 01/27/19 1:46 am. Ya the first pic is what mine looked like at one point with the longer arm and spring up. If you take a look at this picture here, I can't figure out how this spring is supposed to fit like the one in that picture. I actually don't see the spring coming in the hole on the alloy supporting web in that picture either. Im going to say you have the wrong spring. There are a lot being sold that are wound the wrong way. Ill takes some pics when i go out to the shop. I agree with Richrd; wrong spring. Sorry I can't provide a picture; the only one I have on hand now is a '66, which has the flat steel backing plate instead of the alloy webbed backing plate - different setup. I'm going to reverse what I just said. I was just looking at the '70 Tbolt pictured in the "Getting a '70 Thunderbolt Back on the Road" thread. Yes, this will also move the brake arm-end of the spring counter-clockwise, which is what you want. 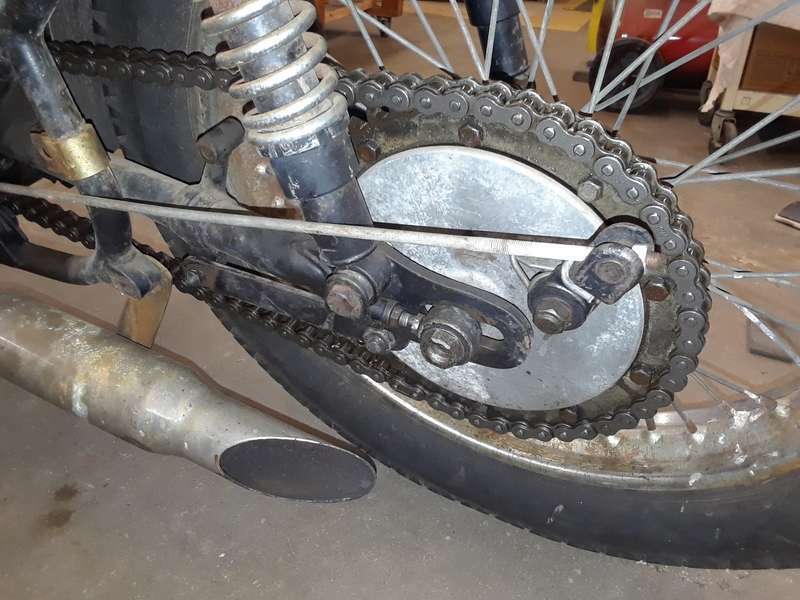 When you install the brake arm, you should have to put tension on the spring to get the brake arm where you want it, and then push it onto the square shaft. Thanks guys. Rich let me know if you snap a pic. That’ll at least clear my sanity a little if it isn’t in fact the wrong spring and then I’ll know I need to try and chase down a properly wound one. Alright, I think this orientation is where I'm leaving it. It seems to be functional, so if anyone bumps into this issue again, here's my setup.